The Carafa Chapel in Santa Maria sopra Minerva is in my opinion the most wonderful Renaissance work to be found in any church in Rome (outside the Sistine Chapel) - it is not only a great masterpiece but it is the only example of Florentine Renaissance in this city (outside the Vatican). 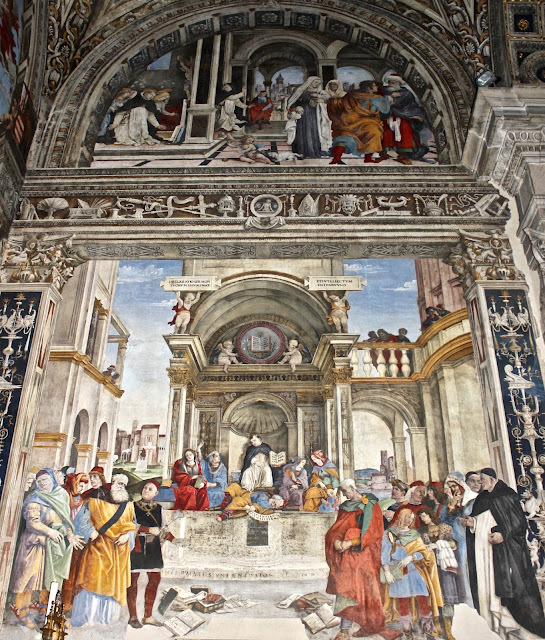 The chapel is located in the right hand transept of the basilica and it is dedicated to the Virgin and Saint Thomas Aquinas - it was built in the late XV century by Cardinal Oliviero Carafa who was known for his strong opposition to the Ottomans - in 1472 he led the Papal Navy in a battle against them and re-conquered the city of Antalya for the Republic of Venice. He was also famous for the commission of a great cloister designed by Bramante in Santa Maria della Pace, near the Piazza Navona. 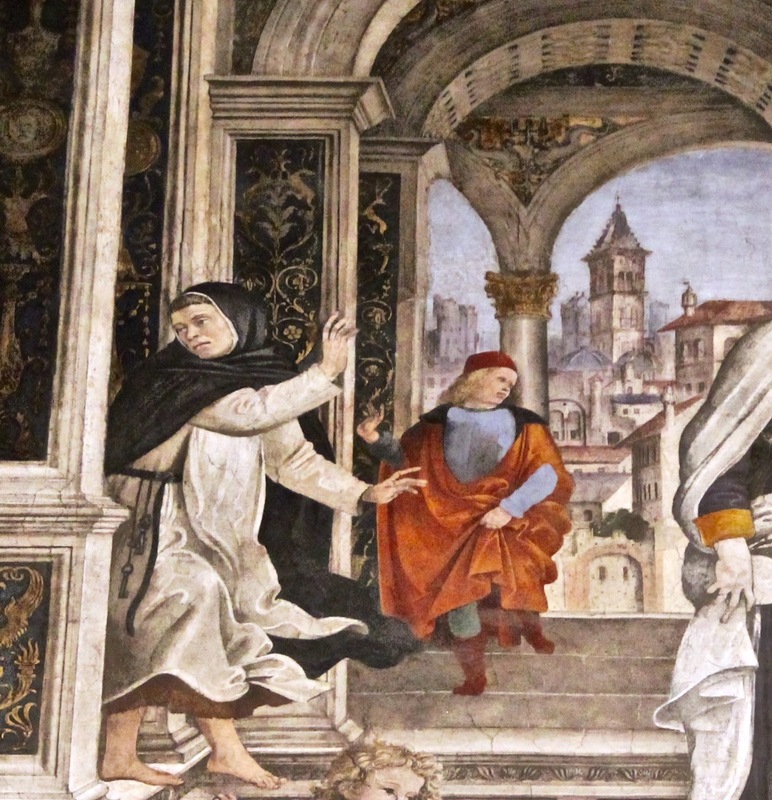 Cardinal Carafa was a dominican - like the friars that administered the basilica - his palace was not too far from the Basilica. 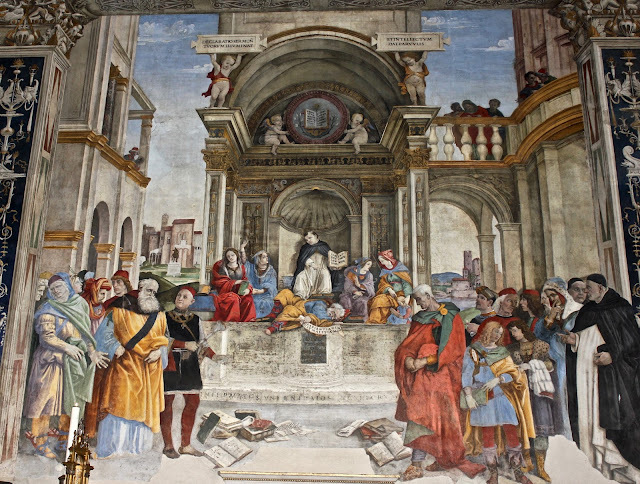 Lorenzo de Medici suggested the cardinal to have his chapel painted by Filippino Lippi, son of Filippo Lippi, who was about thirty years old but who had already showed great artistic abilities. Filippino was already working in the Chapel of Filippo Strozzi in Santa Maria Novella, Florence (another great dominican church) and had to interrupt his work begun in 1487 and which he would have finished only in 1502. 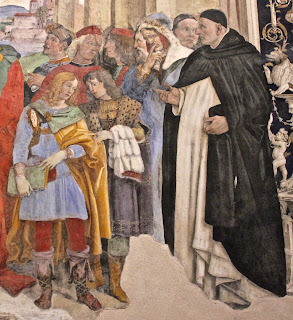 The presence of the artist in Rome is documented from the 27th August 1488 - with his young helper Raffaellino del Garbo. 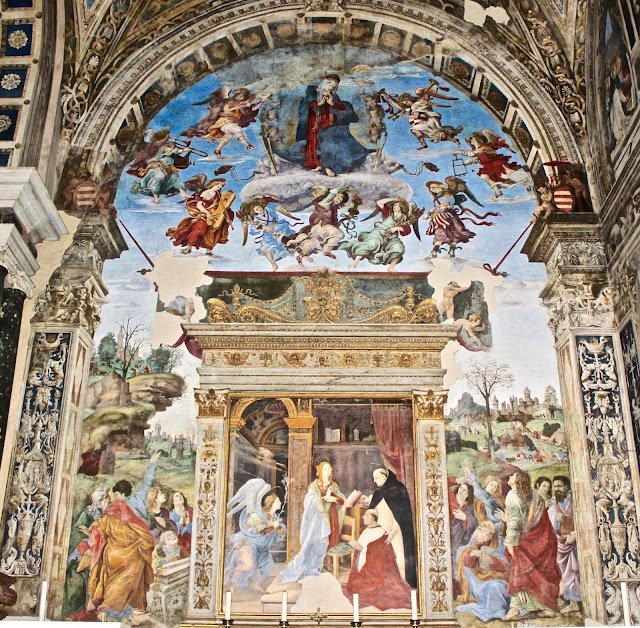 The frescoes were completed in 1493 when they were visited by Pope Alexander VI Borgia. Raffaellino worked on the decoration of another little space next to the chapel which would have hosted the tomb of the cardinal after his death - the theme of the frescoes were stories of the life of Virginia and other episodes based on the theme of chastity which well reflected the austerity of the cardinal’s character. 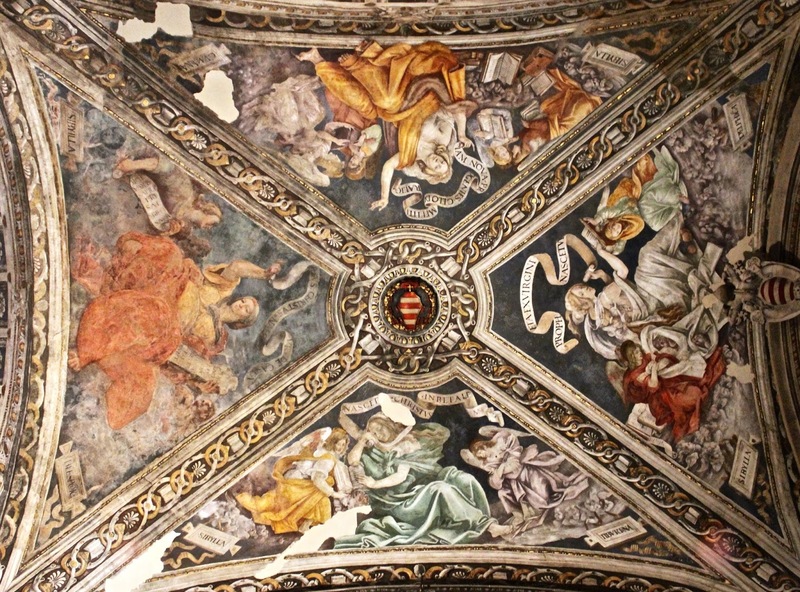 As usual the decoration of the chapel began from the ceiling which was divided into four angular sectors in which the artist depicted four sibyls. The Carafa coat of arms is in the center inside a medallion. 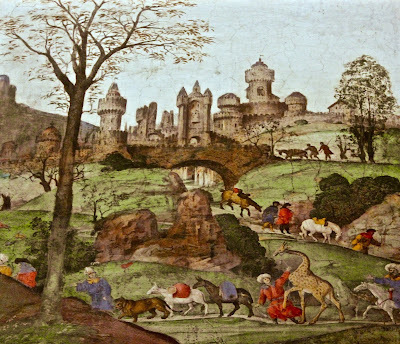 The frames of the scenes include a pattern of diamonds and rings which are a symbol that represents Lorenzo de Medici. There are also some palm branches and books. 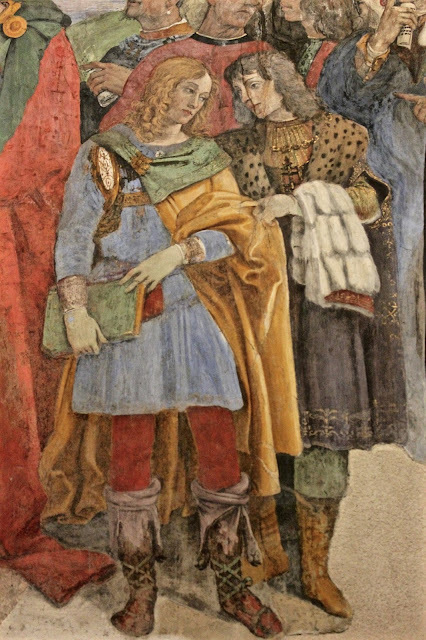 The allusion to the Medici family can be read as a thanksgiving for the peace made by Lorenzo during the Baroni Conspiracy which put the Kingdom of Naples in civil war in 1485. Naples was the cardinal’s hometown. The books represent the cultural interests of the cardinal who owned a large library which was then left to the convent of Santa Maria della Pace where he also commissioned the cloister. 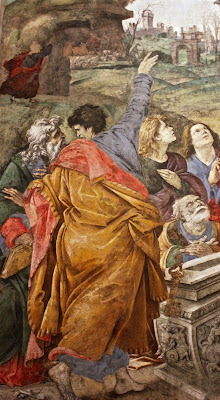 Filippino was the first artist to use the sott’in su - the “from below” perspective, a new technique calibered for the vision from below - this was surely possible thanks to the example of the fresco representing the Ascension of Christ by Melozzo da Forlì in the apse of Santissimi Apostoli (now in the Vatican and the Quirinal Palace). The four sibyls are: Cumana, Libica, Tiburtina and Delfica. Their names are written in Latin in the corners and held by cherubims. They represent knowledge - like the prophets. 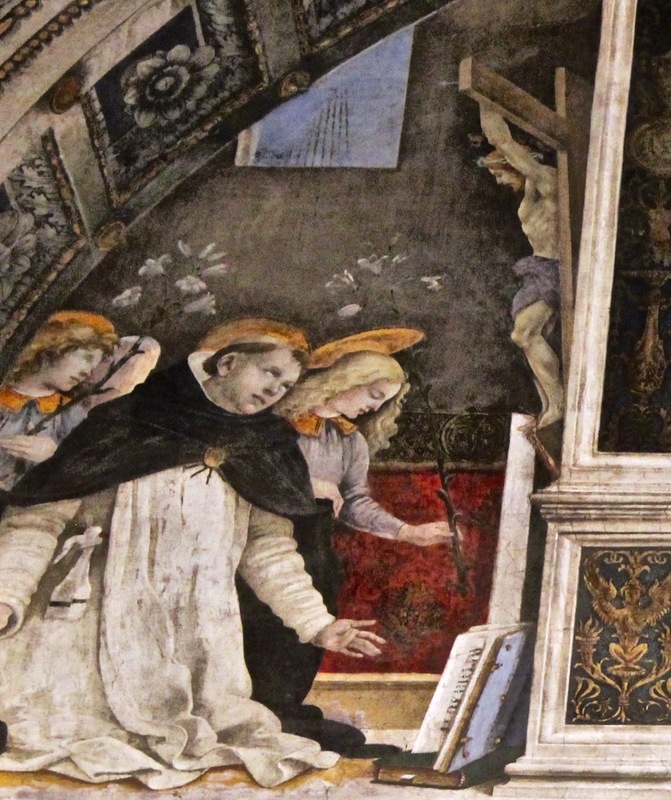 They are holding writings by Saint Thomas and are surrounded by angels holding books or papers on which they are writing or reading. Cumana’s breast is semi-showing but it is not an allusion but it is an element which derives from Medieval theology and which compares the prophecy of a sibyl to milk for a newborn child. The poses are inspired by classical art. the complex poses and the several objects as well as the draperies create a sense of chaos and dynamism which is incredibly expressive - it refuses classical naturalism. The central wall is decorated with a mock altarpiece which is actually a fresco of the Annunciation in the lower part and divided by the upper part by a frame and stucco. The upper part has a representation of assumption of the Virgin. The entire scene is framed by a fake architecture with an arch supported by pillars decorated with monochrome candelabras. An interesting detail is the bow of a Roman ship with an olive branch, an allusion to the military success of "Oliviero" against the Turks. The ship was copied from a marble relief already in the church of San Lorenzo outside the walls (now in the Capitoline Museum) where any part of the boat corresponds, according to Roman tradition, to an organ of the human body: for this is on the bow an eye. 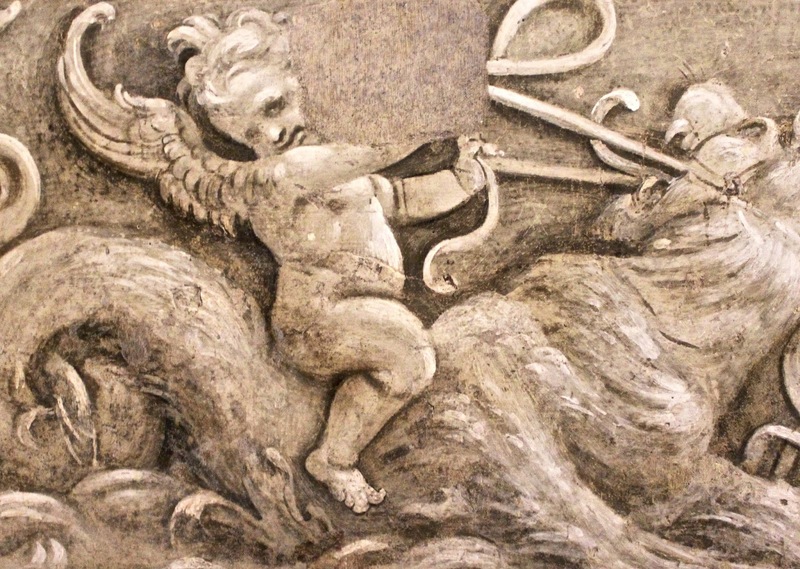 Along the frieze, now visible only on the right wall, run various objects that recall the interests and positions of the cardinal; on the ledge there are then painted angels that hold the Carafa arms. 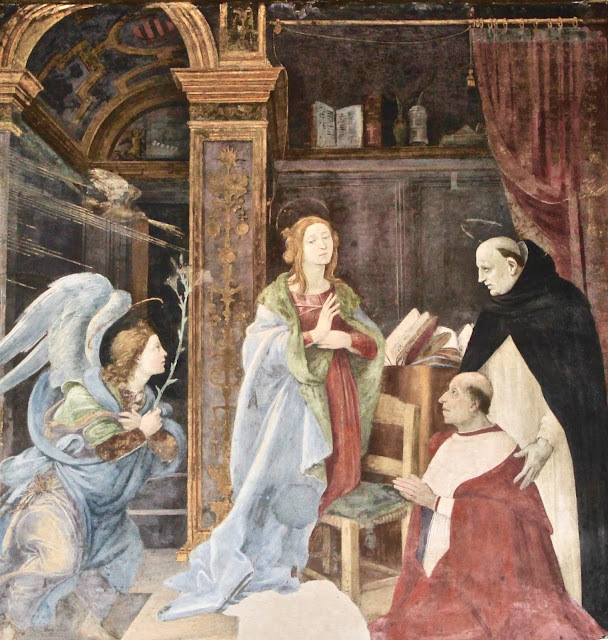 The iconography of the annunciation, with St. Thomas Aquinas, and a kneeling cardinal Carafa. 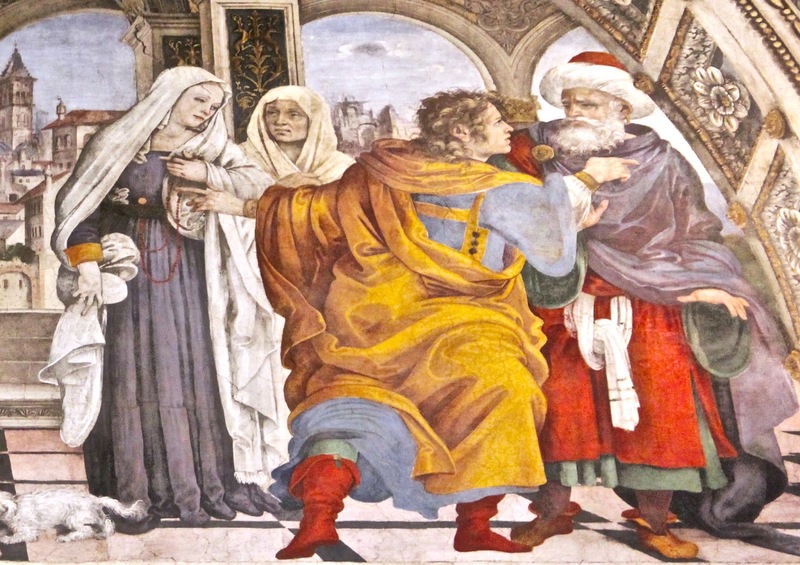 The dual role of Mary is very interesting - while she looks at the Angel that brings the holy announcement, followed by light, she also blesses the cardinal. The cardinal then assumes a leading role in this scene which is set in a small room - Mary is kneeling on a chair, a lectern holds some books, a curtain reveals some still life on the shelf - it is a shelf with books and with a carafe glass, transparent symbol of purity, with an olive branch, a reference to the name of cardinal Oliviero Carafa. To the left is a doorway covered by a barrel vault with the Carafa coat of arms, it suggests that this was inspired by a room in the cardinal’s palace. The mock altarpiece is surrounded on either side by the apostles who stand in awe. The stucco frame with golden decorations light consists of a base, two Corinthian pillars, a frieze of cherubs, festoons and palms, and a coronation with scrolls, vases and busts men, crowned with a basket of fruit (the fruit is compared to St. Augustine and St. Ambrose and good works) and closed by a curtain. On the pillars there is an early grotesque decoration, which shows the influence of the newly discovered frescoes of Domus Aurea. 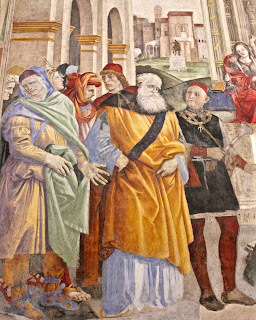 Vasari perhaps exaggerated when he wrote that Filippino was the first to have seen them, but still had to be certainly one of the first visitors. 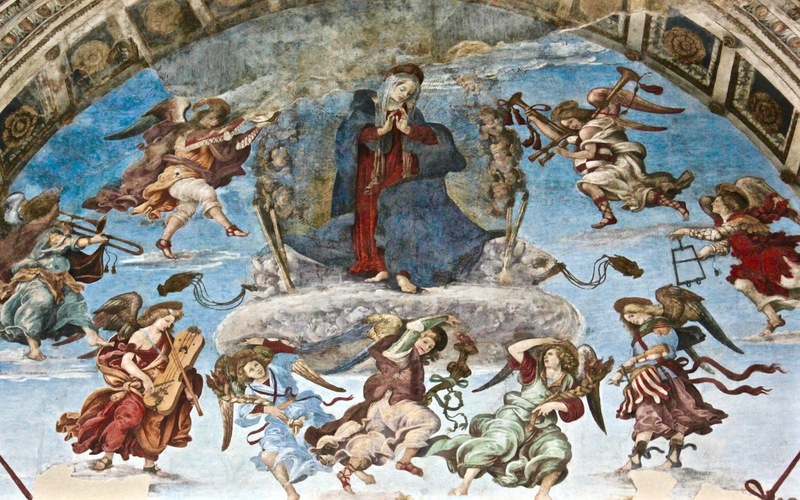 A series of characters painted on the sides of the blade, depicting the Apostles, directs the viewer's gaze towards the miracle that takes place in heaven, the Assumption of the Virgin that is going up on a cloud, pushed by angels, accompanied by lighted candles, as angels scattering incense and a light almond cherubs. 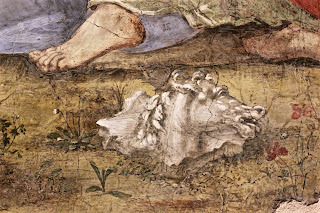 The two censers very faithfully cite those designed by Botticelli in the fresco of the Punishment of the rebels in the Sistine Chapel, where probably Filippino collaborated. If the Virgin is represented in the traditional way, with a frontal view, freedom is found in musical angels that dance around, imitating those of Melozzo da Forli. From left (counterclockwise) there is an angel with tambourine, one with a trumpet, one with the psaltery, then three angels with torches that push the cloud, then one with drums tied at the waist, one with the triangle (in this case trapezoidal) and one with a bagpipe: these are instruments of military troops at the time, adapted to create a loud music, rather than the traditional barrel organs, lutes and strings from "inside". Bagpipes, military instrument par excellence, is decorated with parallel stripes red and white and alludes to the emblem Carafa and naval successes. The angels create a lively circle, the poses have great vitality and are “electrified” by linear games of the drapery and ribbons flying around. Behind the Apostles in the lower part, there is a procession of colorful characters and exotic animals, perhaps alluding to the triumph that the cardinal received back from the victorious military campaign. The giraffe was instead being seen by Filippino in Florence (one had been given a couple of years before Lorenzo il Magnifico arousing intense interest in the population), turning on his imagination. An interesting detail is also that of the often present Roman ruins that symbolize both the overcoming of Christianity over paganism, while being also a Renaissance reference to its Classical past. 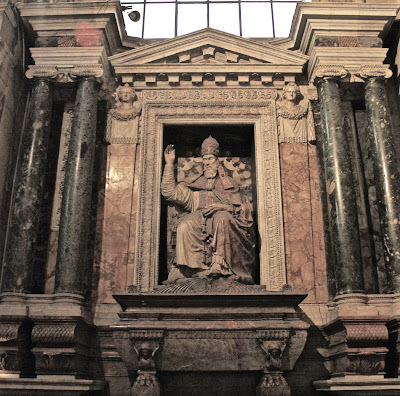 The left wall now hosts the monument to Pope Paul IV Carafa by Pirro Ligorio, which destroyed the original frescoes of Vice and Virtue known only by the description of the Vasari. The right wall has an architectural decoration which is similar to that of the central wall, but it is divided by a frieze in the center. The wall hosts two frescoes: St. Thomas in the chair (or Dispute of St. Thomas) and the Miracle of the book. The scene of St. Thomas in the chair is set in an airy space enclosed in classical architecture - in a covered pavilion vault with a round arch, which leads to the right, through an archway, with a terrace, a building continues next - where there are some characters. Under the niche is Thomas Aquinas surrounded by symbolic figures further down out of the niche, two symmetrical groups of characters. 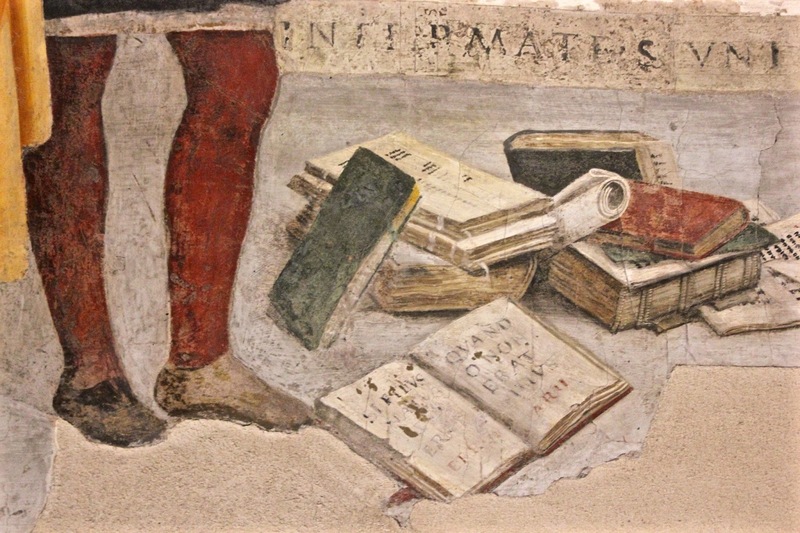 Thomas holds an open book with the inscription "Sapientiam sapientum perdam", taken from the words of St. Paul, which means "I will destroy the wisdom of the wise", and at his feet is a squat figure lying on the ground and covered with books, obvious personification of Sin, with a cartouche reading "Sapientia malitiam Vincit" ("Wisdom wins malice"), an allusion to the typical Dominican role of knowledge to recognize and fight vice and heresy. On either side of the saint are various personifications, with names engraved in gold letters on the clothes: Left Philosophy, Theology (with the crown, it addresses the saint), the Dialectic (with typical attribute of the snake) and Grammar (who teaches reading to a child and holding a rod to punish any student’s laziness). 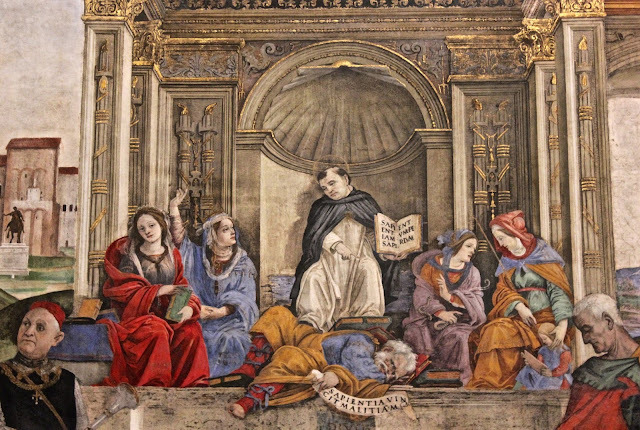 The characters in the foreground instead are mostly figures of heretics, even in this case the golden inscriptions on the garments are recongizable, in some cases difficult to read today. 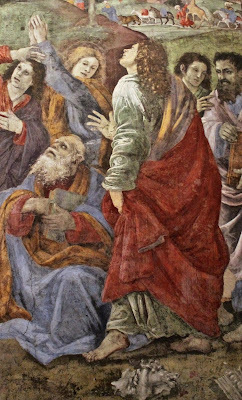 There is Mani, with his finger on his lips, Eutyches, with a Pearl Earring, Sabellius, that reminds one of the Dacian Prisoners Arch of Constantine, Arius, with the yellow dress, etc. The books on the ground are obviously those of heretics and are destined for the stake. On the right stands a Dominican monk in the foreground, identified by Gioacchino Torriani, Master of the Order. On the other side is rather Niccolo Orsini, head of the papal army, which seems ready to implement the judgment of Thomas. The fate of heretical books is not explicitly revealed, but you can also report the presence in the frieze “dell’acerra", one of the boxes in which the Romans held the incense to be burned on the sacrificial altars, which in this case contains a book instead. The two side buildings that act as a backdrop are reminiscent of Umbria, as in the Funeral of San Bernardino by Pinturicchio in the Cappella Bufalini in the Basilica of Santa Maria in Aracoeli. On the left we see a city with a landscape on which stands the equestrian statue of Marcus Aurelius, who at the time was in the Lateran and it was believed to be a portrait of the emperor Constantine. The lunette contains more episodes of the life of St. Thomas. 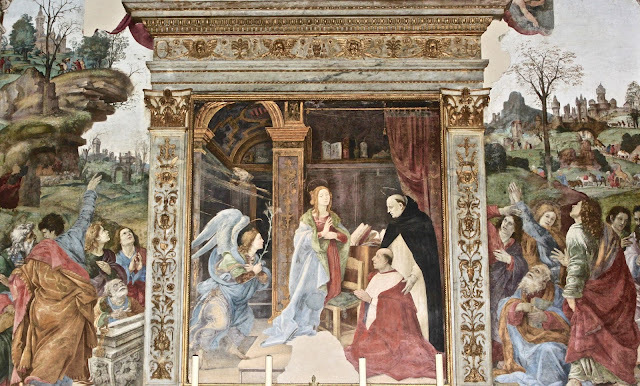 To the left is the Miracle of the book, set in an interior, where Christ turned to the saint by the crucifix to praise his work, saying: "Bene scripsisti de me Thoma". Miraculous apparition a monk escapes frightened by the door. 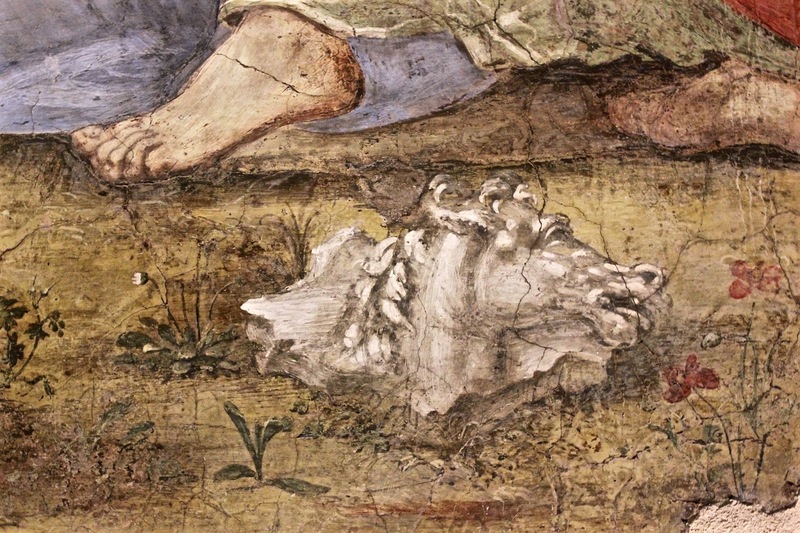 The presence of angels with white lilies, symbols of purity and the fact that one of them deviates the mantle of Thomas to show the tied belt also refers to another episode in the life of the saint, when two angels appeared and tied him as a symbol of chastity for its resistance to the offers of a prostitute sent by the family of Thomas to distract him from monastic life. 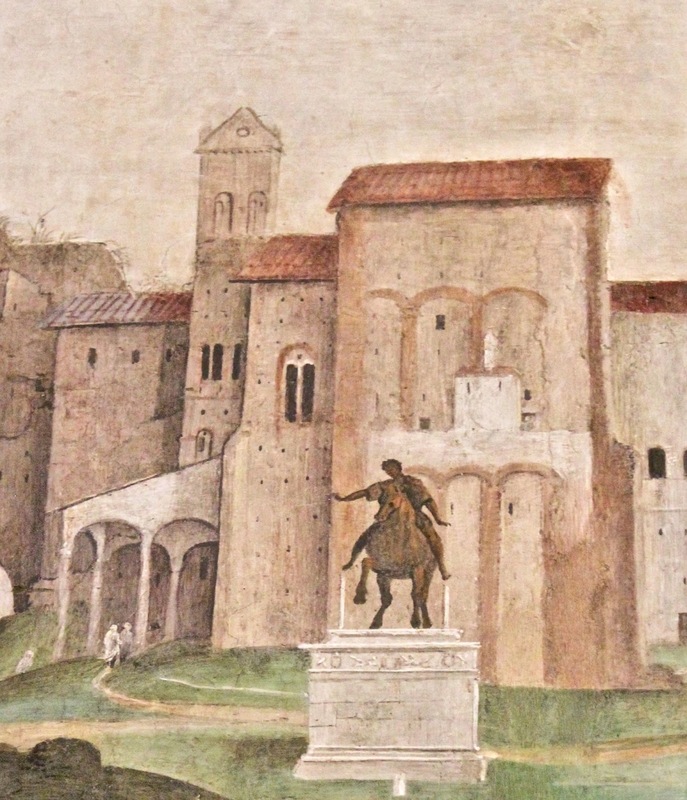 The right side is set against a porch over the arches - there is a city in the background, while a figure dressed in red is coming down the stairs in the center. The identification of the characters in the foreground is more complex. 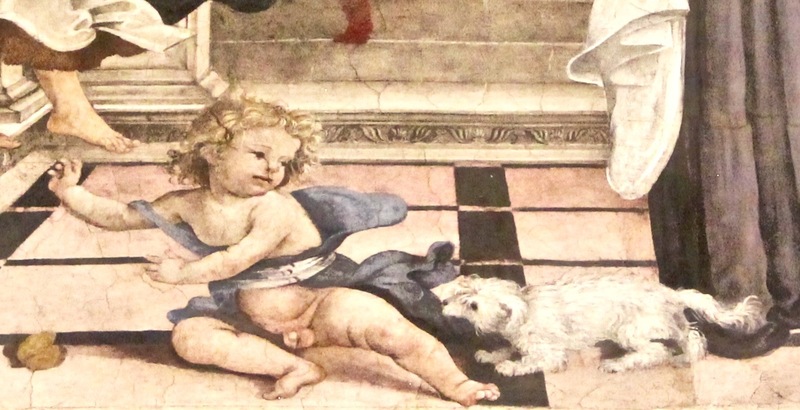 The dog that attacks the child is usually a personification of the devil that threatens the purity of childhood. 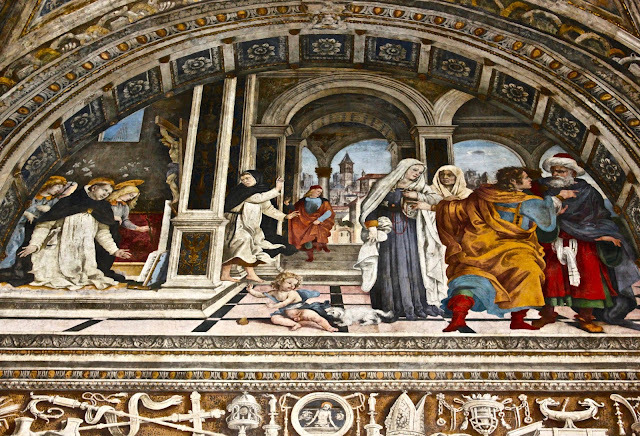 The woman with the monk's habit and rosary tucked in his belt is probably a personification of the Church, and the man coming down the stairs could be her husband Christ, the red suit is reminiscent of the Passion. 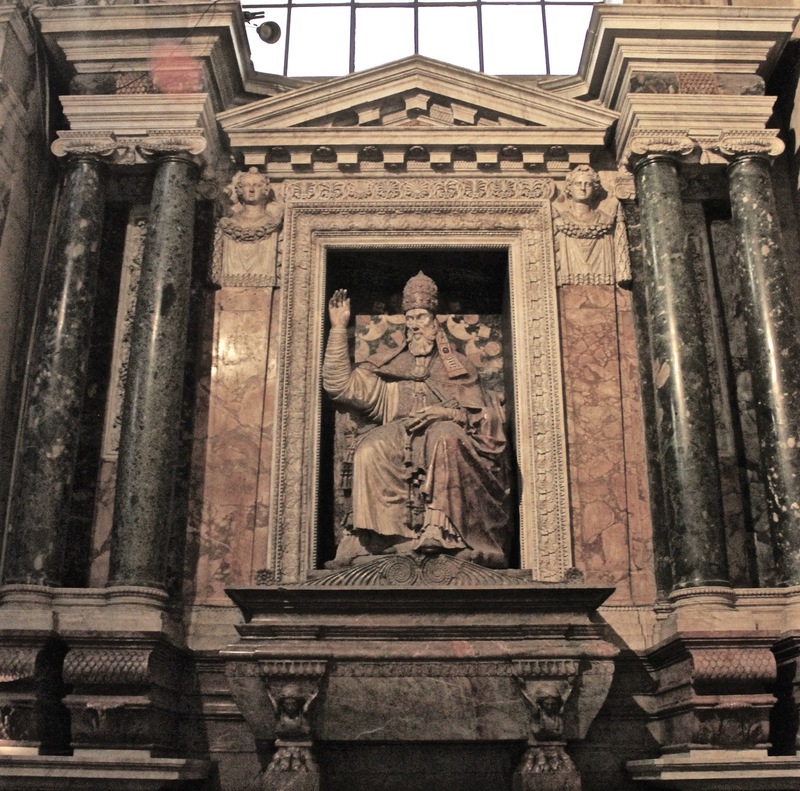 His figure is also above Imago Pietatis lintel. The child would then, according to the allegorical writings of Hugh of Saint Victor, the symbol of the clergy, born of the union of Christ with his bride. The character on the right is dressed as a Muslim and shows the woman representing the Church by a man from the back dressed in yellow, who seems to want to convert. 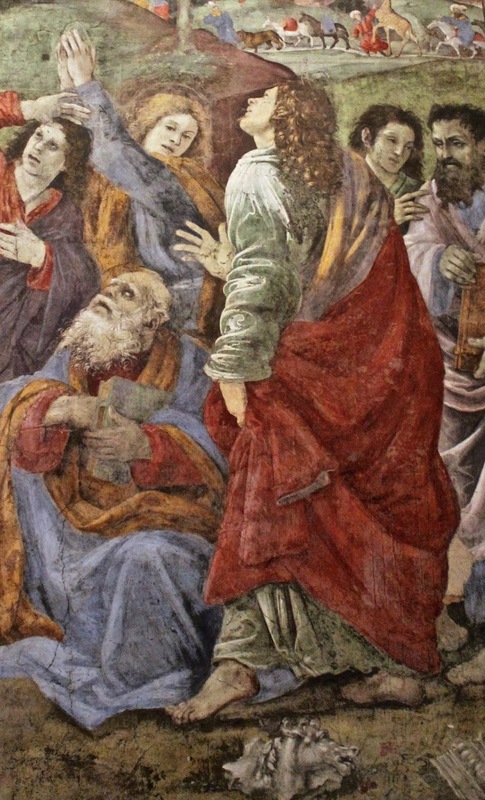 The woman in the background could be a depiction of the Synagogue, as found in the painting of the Trials of Moses by Botticelli in the Sistine Chapel.